We wanted to utilise the recently released GNAF data to build a web map which would inform people of something both interesting and important. 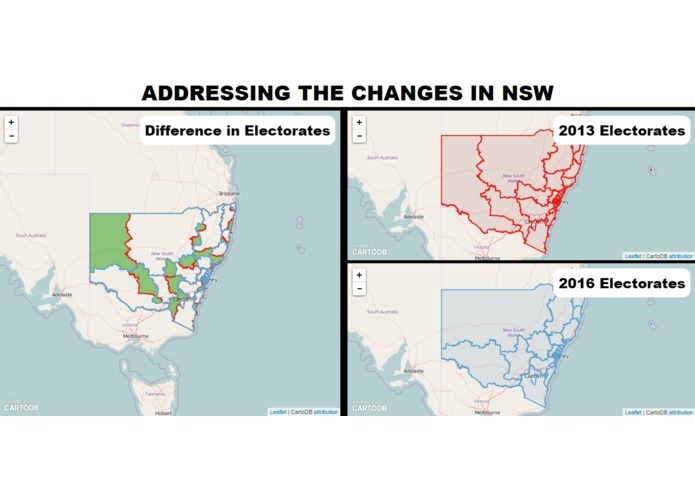 Knowing that there is an election coming up this year, we thought it would be quite topical to look at the redistribution of electoral boundaries, particularly in NSW, as it has made it in the media in recent times. We have built a web-based map service which utilises GNAF address and administrative boundary data to show the change in electoral boundary an address belongs to in 2016 compared to 2013. The main processing software platforms used in this project include ArcGIS, Python and CartoDB. Spatial Analysis was undertaken to determine which electorate an address was encompassed by in both 2013 and 2016. This change in electoral boundary distribution has been summarised, both by area and change in actual address numbers. The results from this analysis were uploaded to CartoDB and displayed in a web-mapping service where users could click on an electoral boundary and observe the changes in area and addresses they encompass. Initially, we wanted to build in the ability for a user to search through the GNAF geocoded addresses to see if their address has undergone any sort of change in the last three years. This may then result in a change in MP and could affect their voting preferences come election time. The idea is that our web service would allow people to have access to this data to be informed. Unfortunately, we didn’t have access to enough capacity for processing the large number of addresses (over 4 million) in NSW to implement this search functionality. Our project demonstrates our ability to spatially manipulate the GNAF data and use it in a web mapping service so that the public can be informed of the changes in electoral boundaries over the last three years. We would like to think that it is a simple yet effective way of visualising this data and the results of our analysis. 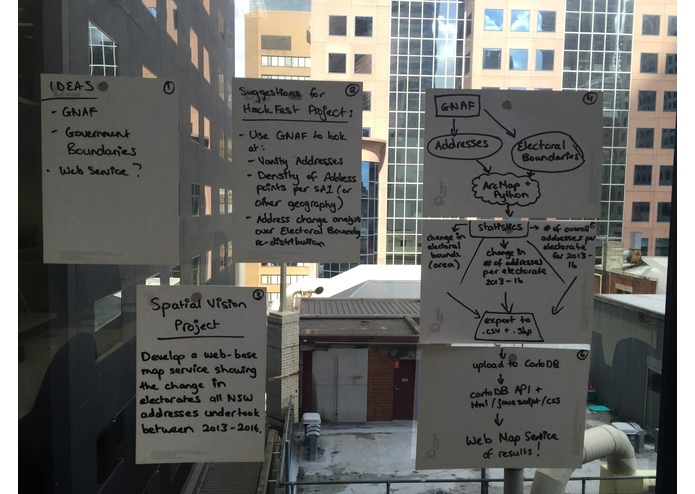 We now have a greater understanding of how the GNAF data model works and the complexities in using such a large data bank to process this data into the results we were aiming for. We understand that the addresses included are not all purely residential addresses, but given the time and data constraints, we have generated results for all addresses. In the future, we hope that we can continue building on this concept and perhaps incorporate some ABS statistics to analyse population factors, or look at how people’s preferences could change depending on suburb socio-economic factors. There are lots of avenues we can investigate and look forward to building on the design we have. We would like to nominate our current project for the "PSMA - Best Use of Location Information" prize organised by the Locate16 conference.